Photoacoustic tomography is a hybrid imaging technique that combines high optical tissue contrast with high ultrasound resolution. Direct reconstruction methods such as filtered backprojection, time reversal and least squares suffer from curved line artefacts and blurring, especially in case of limited angles or strong noise. In recent years, there has been great interest in regularised iterative methods. These methods employ prior knowledge on the image to provide higher quality reconstructions. However, easy comparisons between regularisers and their properties are limited, since many tomography implementations heavily rely on the specific regulariser chosen. To overcome this bottleneck, we present a modular reconstruction framework for photoacoustic tomography. It enables easy comparisons between regularisers with different properties, e.g. nonlinear, higher-order or directional. We solve the underlying minimisation problem with an efficient first-order primal-dual algorithm. Convergence rates are optimised by choosing an operator dependent preconditioning strategy. Our reconstruction methods are tested on challenging 2D synthetic and experimental data sets. They outperform direct reconstruction approaches for strong noise levels and limited angle measurements, offering immediate benefits in terms of acquisition time and quality. This work provides a basic platform for the investigation of future advanced regularisation methods in photoacoustic tomography. 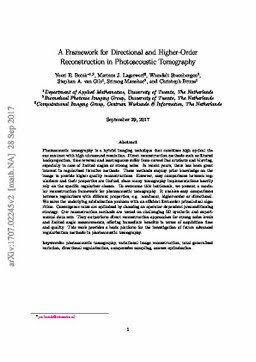 Boink, Y.E, Lagerwerf, M.J, Steenbergen, W, van Gils, S.A, Manohar, S, & Brune, C. (2017). A framework for directional and higher-order reconstruction in photoacoustic tomography.